Actors Theatre of Louisville is thrilled to announce the upcoming production of The Curious Incident of the Dog in the Night-Time from September 18 – October 10, 2018, presented as part of the Brown-Forman Series. In this Tony Award-winning adaptation of the bestselling novel, autistic teenager Christopher investigates the mysterious death of his neighbor’s dog after he’s wrongly accused of the crime. Actors Theatre’s associate artistic director, Meredith McDonough, will direct. Audiences will remember her recent productions at Actors Theatre, including last season’s Angels in America, Parts One and Two; The Santaland Diaries; and the Humana Festival of New American Plays premiere of Marginal Loss. Alexander Stuart makes his regional debut as Christopher Boone. Stuart recently earned his B.A. in theatre from Columbia College Chicago, where he worked with Interrobang Theatre Project, Citadel Theatre Company and RhinoFest 2018 at Abaisses Theatre. Tina Chilip (Classic Stage Company, Fiasco Theater, Ma-Yi Theatre, National Asian American Theatre Company, Huntington Theatre Company – IRNE Best Actress nom) makes her Actors Theatre debut as Christopher’s beloved teacher Siobhan. Local audiences will be delighted to see two familiar faces from last season return to the stage: Brian Slaten (Angels in America, Parts One and Two) and Jessica Wortham (Marginal Loss) in the roles of Christopher’s parents. Sherman Fracher, Sunny Hitt, Maya Loren Jackson, Luis Moreno, Trevor Salter and Seun Soyemi create the ensemble, each playing multiple roles. The creative team features scenic design by Kristen Robinson, lighting design by Paul Toben, costume design by Kathleen Geldard, sound design by Christian Frederickson, media design by Philip Allgeier and movement direction by Sam Pinkleton. Talleri McRae will serve as the production’s Access & Inclusion Consultant. Paul “Pablo” Mills Holmes will serve as production stage manager, Jessica Kay Potter will serve as assistant stage manager and Jenni Page-White will be the dramaturg. The Theatre will offer an open captioned performance on September 29 and an audio described performance on September 30. For more information on the facilities and all services offered, visit ActorsTheatre.org. Tickets are now on sale to the public and are priced from $25. Tickets can be purchased by calling the Actors Theatre Box Office at 502.584.1205 or online at ActorsTheatre.org. Special ticket rates for groups of 10 or more are available by calling 502.585.1210. 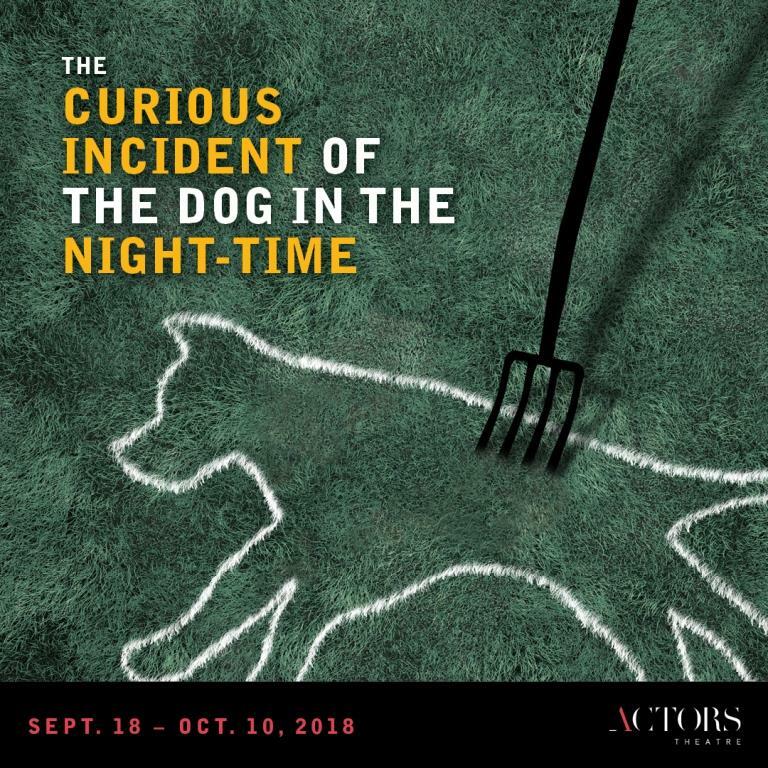 The Curious Incident of the Dog in the Night-Time is made possible in part by series sponsor Brown-Forman, the Kentucky Arts Council and Fund for the Arts. Additionally, Actors Theatre’s educational outreach for The Curious Incident of the Dog in the Night-Time is made possible by Yum! Brands Foundation and their sponsorship of Actors Theatre’s Student Matinee Series. Tickets are on sale now and priced from $25. Special ticket offers for groups of 10 or more are available by calling 502.585.1210. After a light reception, guests will hear from a member of the production team and have a glimpse of what goes on during a technical rehearsal. To reserve, please visit ActorsTheatre.org. #PlayOurPart is a national, nonpartisan movement to increase voter participation by registering voters in theater lobbies. On select dates this fall, anyone can register to vote in our lobby. Forms will be available onsite and we’ll mail it in for you. Friday, September 28 at 8 p.m.
Open Captioned Performance: Saturday, September 29 at 2:30 p.m. Audio Described Performance: Sunday, September 30, 2018 at 2:30 p.m.
Sensory Friendly Performance: Sunday, October 7 at 2:30 p.m. (This performance affords a relaxed atmosphere with slightly raised house lights. Audience members may move about or exit the theatre as needed. For more information, please visit ActorsTheatre.org.